I’m Marie from Underground Crafter and today I’m sharing the pattern and a tutorial for the Catherine Wheel crochet stitch. 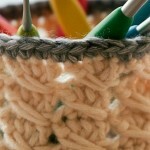 This is a classic crochet stitch and has many variations. It’s also a great way to practice changing colors, increasing, and decreasing. You can use just 2 colors for your version, or you can use many colors. Make a practice swatch with stash yarn, or get started on a project right away! The Catherine Wheel Crochet Stitch is often used in blankets but it is also a great stitch for bags and hats! Let your imagination run wild. I’ll be sharing the complete stitch pattern with the photo tutorial afterwards to illustrate the special stitches and color changes. dc3tog – double crochet 3 sts together (decreases 2 sts) – (Yo, insert hook in next st, yo and draw up a loop, yo and draw through 2 loops) 3 times, yo and draw through all 4 loops on hook. dc4tog – double crochet 4 sts together (decreases 3 sts) – (Yo, insert hook in next st, yo and draw up a loop, yo and draw through 2 loops) 4 times, yo and draw through all 5 loops on hook. dc7tog – double crochet 7 sts together (decreases 6 sts) = (Yo, insert hook in next st, yo and draw up a loop, yo and draw through 2 loops) 7 times, yo and draw through all 8 loops on hook. * Rep instructions after asterisk as indicated. To avoid puckering, work decreases and color changes loosely. With CA, ch any multiple of 10 sts, + 7 sts. Foundation row: Turn, sk first ch, sc in next 2 ch, *sk 3 ch, 7 dc in next ch, sk 3 ch, sc in next 3 chs; rep from * across to last 4 ch, sk 3 ch, 4 dc in last ch, changing to CB in last yo of final dc. Row 1: Turn, ch 1, sc in first 2 sts, *ch 3, dc7tog, ch 3, sc in next 3 sts; rep from * across to last 4 sts, ch 3, dc4tog in last 4 sts. Row 2: Turn, ch 3 (counts as first dc, here and throughout), 3 dc in first st, *sk 3 chs, sc in next 3 sts, sk 3 ch, 7 dc in next st; rep from * across to last 5 sts, sk 3 chs, sc in next 2 sts, changing to CA in last yo of final sc. Row 3: Turn, ch 3, sk first st, dc3tog, *ch 3, sc in next 3 sts, ch 3, dc7tog; rep from * across to last 2 sts, ch 3, sc in next 2 sts. Row 4: Turn, ch 1, sc in first 2 sts, *sk 3 ch, 7 dc in next st, sk 3 ch, sc in next 3 sts; rep from * across to last 4 sts, sk 3 ch, 4 dc in last st, changing to CB in last yo of final dc. Rep Rows 1-4 until desired length is reached, ending on Row 2 or 4 for curved edge or on Row 1 or 3 for straight edge. In this pattern, you always change colors in the last yo of the final st of the row. Draw CB through both loops. 5. Draw CA through both loops. 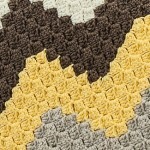 You can carry the unworked colors up the side of your piece if you prefer not to weave in ends. If you are carrying yarn, remember not to pull the new color through too tightly or you’ll pucker your piece. In Row 1, you’ll encounter your first decrease in this pattern, the dc7tog. After you master this the rest of the decreases in the Catherine Wheel will be a breeze! Now you’ll repeat this in the next 6 stitches – for 7 stitches total. You’ll end each repeat with an additional loop on the hook, until you end up with 8 loops (picture 6). Then yo and draw through all 8 loops (picture 8). Later in the pattern, you’ll complete a dc3tog and dc4tog. Start with the same steps, but don’t repeat as often. For the dc3tog, yo and draw through when you have 4 loops left on the hook (picture 2). For the dc4tog, yo and draw through when you have 5 loops left on the hook (picture 3). I hope you enjoyed this tutorial and have plenty of fun with your Catherine Wheel projects. You can find more of my free crochet patterns on my blog here. For more crochet afghan pattern inspiration and tutorials, be sure to follow our Pinterest account. 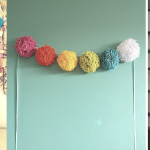 Visit AllFreeCrochetAfghanPatterns’s profile on Pinterest. 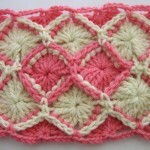 Enter to win a Granny Square Scarf Kit! One lucky winner will receive this fun and easy scarf kit. The deadline to enter is July 12, 2015 at 11:59:59 p.m. Eastern time. The Granny Square Scarf Kit includes a full-color instruction booklet, a crochet hook, a yarn needle, and four colors of yarn for you to work with as you start your scarf. 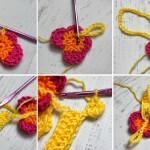 Crocheting a scarf may seem daunting, but when it is combined with a beginner’s technique like making granny squares, you are left with an easy and fun project. What would you make with the Catherine Wheel? 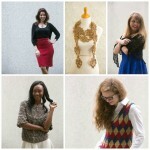 Marie Segares is a crochet and knitting blogger, designer, and teacher. 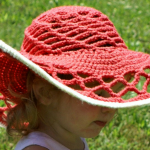 She has been hooked on crochet since she learned her grandmother when she was 9. She conquered her fear of knitting in 2010 and is now happily bi-craftual. 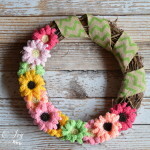 She shares her crafty adventures, free crochet patterns, crochet and knitting book and product reviews, and more on her blog, Underground Crafter.